Magnavox MDR-Series DVD Recorder Title Editing Menu Example. DVD recording used to be very popular, but with the increased implementation of copy-protection, on-demand internet streaming, cable/satellite DVRs, and the analog-to-digital TV transition, recording onto DVD is not as common as it once was. However, one of the great things about DVD recording is saving your memories onto a physical disc for later playback. However, you might not always want to watch the entire disc, but only a specific portion. Also, if you forget to label your disc, you might not remember everything that is on it. You can always put the disc in your player and fast or skip forward using the time elapsed counter, but if the disc has chapters, similar to what you find on commercial DVDs, it would be a lot easier to find and play what you want. You can organize DVDs made using a DVD recorder using automatic indexing or manually creating/editing chapters. On most DVD recorders, as you record a video onto a DVD, the recorder will typically insert automatic index marks about every five minutes on the disc. However, if you are using an RW (re-writable) type of disc (you cannot make changes on a DVD- or +R disc), or, if you have a DVD recorder hard drive combo where you can temporarily store a recording before copying it to DVD, you also have the option (depending on the recorder) to insert or edit your own index marks. These marks are invisible and do not appear on the DVD's menu. Instead, they are accessed through the NEXT button on your DVD recorder or player remote when you play the disc back. Although the DVD recorders that the disc was recorded on will recognize these marks when you play the disc back, It is not guaranteed, that if you play the disc back on another DVD player, will recognize these marks, but most players will. However, you won't know this ahead of time. The other way you can organize your DVD is by creating actual chapters (sometimes also referred to as Titles). In order to do this on most DVD recorders, you must record a series of video segments separately. In other words, if you want to have six chapters on your DVD, you record the first segment, stop the recording process (rec stop, not rec pause) - then start the process over again. Also, if you are recording a series of TV programs using a DVD recorder timer system, each recording will have its own chapter as the recorder stops recording one program and starts recording another. Of course, if you are recording two programs back-to-back without stopping and restarting, they will be in the same chapter. Every time you start a new segment, a separate chapter is created automatically on the DVD's menu, which you can go back and add or name/rename a chapter/titles using an onscreen keyboard. Typically, the automatically chapter/titles are usually date and time stamps - so the ability to add a name or other custom indicator can allow easier chapter identification. It is important to point out that there may be some variations (like the look of the DVD menu and additional editing capabilities depending on the DVD format used, or whether you are using just a DVD Recorder or DVD recorder/Hard Drive combo). However, the basic structure outlined above is fairly consistent across the board when using basic standalone DVD Recorders. If you wish to be more creative, with respect to creating a more professional looking DVD with chapters, titles, graphics, transitions, or add audio tracks, it is best to use a PC or MAC equipped with a DVD Burner, in conjunction with the appropriate DVD editing or authoring software. Depending on the specific software used, you may be able to create a DVD menu that looks similar to what you may find on a commercial DVD. Similar to a VCR, DVD recorders provide a way for consumers to record video content onto a physical format that can be conveniently played back later. However, DVD recorders also provide the added perk of better video recording quality, depending on the source and record mode used. 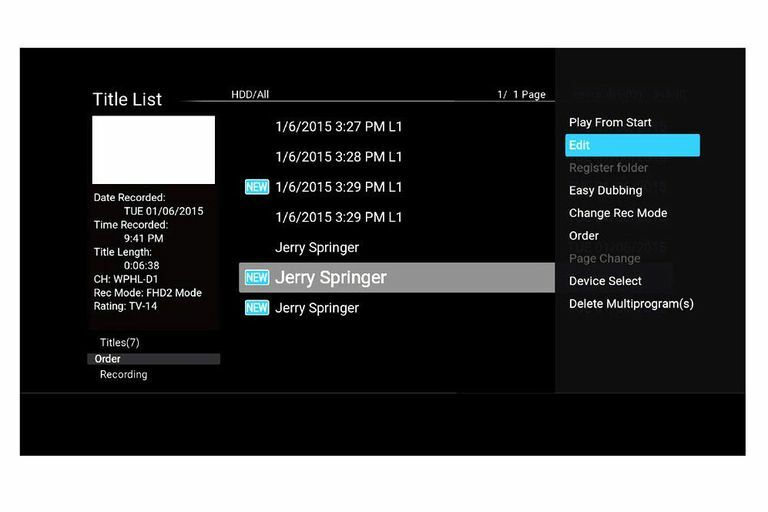 In addition, a DVD recorder also provides automatic indexing as well as basic chapter/title creation that enables an easier way to find points of interest on the recorded disc when playing it back. The chapter/titles creation capabilities of DVD recorders are not as sophisticated as what you will find on a commercial DVD, but if you have the time, instead of using a DVD recorder, the proper PC/MAC DVD editing/authoring software can provide you with more creative options.